I tend to think everything tastes better when grilled, which is how this recipe evolved. 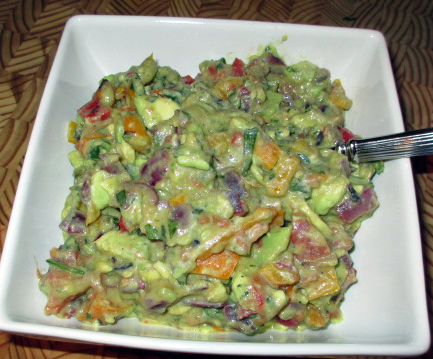 My husband could sit and eat a bowl of this guac with a spoon, if left to his own devices. It's fantastic over Fajita-Marinated Chicken, a great topping on your favorite omelette, takes a turkey wrap or grilled cheese to new heights -- or keep it old school & devour with a bag of your favorite tortilla chips. 1. Preheat your grill to medium to medium-high heat. Toss your jalapeno, yellow pepper and tomato in a bowl, and give a light splash of olive oil and sprinkling of kosher salt and pepper. Swish around in your bowl to give all of your veggies a light coating of oil. 2. Grill your veggies for 3-4 minutes per side, until they are nicely charred. Remove from grill and set aside to cool. 3. While grilled veggies are cooling, cut avocados in half and remove pits. Using a large spoon, remove from shells. Roughly chop and add to a medium bowl. 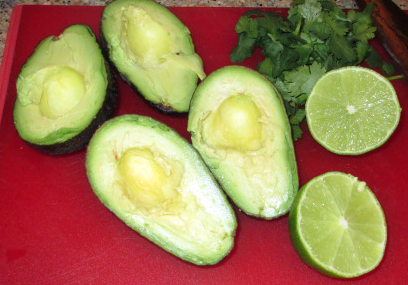 Cut lime in half and squeeze juice over chopped avocados; stir to combine. 4. Once veggies are cooled, roughly chop (large dice) the tomato, yellow pepper, and onion rings; add to your bowl with the avocado-lime mixture (don't worry about peeling the yellow pepper). For the jalapeno, remove the core and seeds, taking extreme care to wash your hands immediately after handling. Finely dice the jalapeno, and add to taste, depending on your preference for spiciness. Note: Typically, I use 1/4 to 1/2 of the jalapeno, which seems to work for hubby and my 5-year old; I put the remaining chopped jalapeno on my serving, for a little extra kick. 5. Add chopped fresh cilantro to the bowl and mix to combine. Add kosher salt and pepper, to taste, mixing well to combine all ingredients. Serve and enjoy!